The Checkbox field creates a list of tick-able inputs. 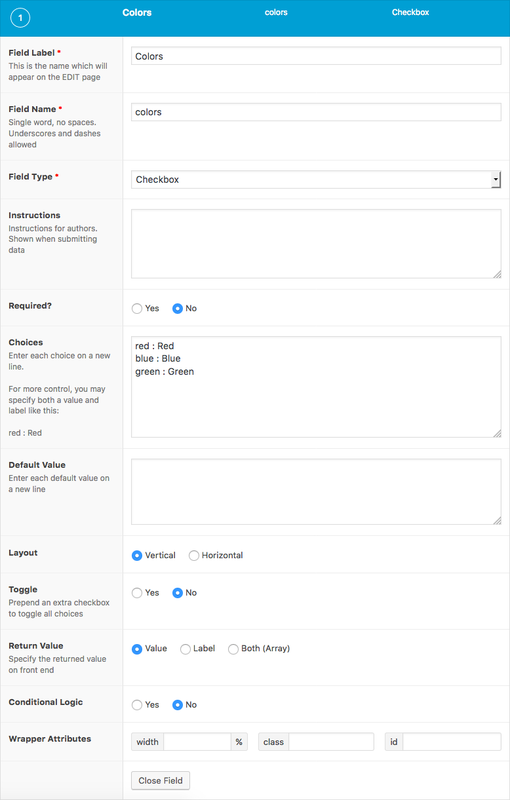 If using the local JSON feature, any custom values saved to the field’s choices will not appear on page reload. This is because the JSON file will not be updated and will override any field settings found in the DB. The checkbox field will return an array of selected choices. Either use the get_field() function to obtain this array, or use the_field() to simply output the values, each value separated by a comma (if more than one). This example shows how to display a comma separated list of selected values. This example shows how to query posts that have the value ‘red’ selected. The checkbox field saves it’s value as a serialized array, so it is important to use the meta_query LIKE compare. 'value' => '"red"', // matches exactly "red"